Well well well…did you expect me to make a mini cake for two with part of a cake mix? I conveniently realized that a cake baked in a 9″ square pan becomes two large pieces of cake once stacked and sliced. How many life occasions do you need just two slices of cake? On Mondays? On Fridays for celebrating? Everyday? Let’s stick with everyday. Baking a 9″ cake from a cake mix requires 2 cups of cake mix. (To use the remaining 1 cup of cake mix from the box, try my Frosted Eggnog Cookies). The dreamy part of this cake is the rich cranberry butter. I made Audra’s cranberry butter, and instantly knew that it should be slathered between light, fluffy vanilla cake layers. And the cream cheese vanilla frosting? Well, it’s my go-to during the holiday season. I happen to think dairy makes almost any recipe better. Butter, cream, sour cream, cream cheese–who’s with me? I’ll even admit to you that I’m an adult that drinks milk daily. Weird, right? It shouldn’t be weird! I think of milk as nature’s gatorade, but better. Milk is the single greatest source of three of the four nutrients the Dietary Guidelines identified as lacking in the American diet – calcium, vitamin D and potassium. And, since the American Dairy Association Mideast has partnered with Feeding America, more nutritious dairy products will be put in food banks across the country. How can you help? I’m so glad you asked! We’re hosting a“Big Holiday Potluck,”and ADA Mideast will donate $1 to Feeding America for every “like,” comment or share each of the bloggers’ 12 recipes receive on its Facebook page between Dec. 6 and 13. So, be like me and drink milk! And help others drink it, too! So, head on over to the American Dairy Association Mideast Facebook page and click ‘LIKE!’ Each time you do, you’re helping feed people. And that’s pretty great. PPS I tried to take this cow home with me. It was awkward for all parties involved. First make the cake: Preheat the oven to 350. Spray an 8x8" pan with cooking spray. 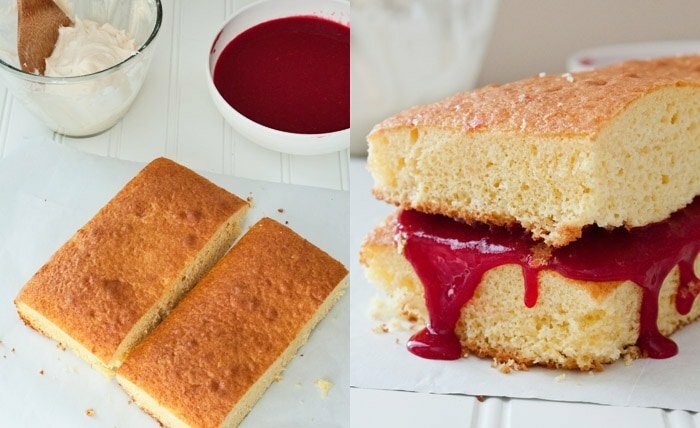 Combine all the ingredients for the cake and beat with an electric mixer for 1 minute. Pour into the cake pan and bake for 25 minutes, or until a toothpick inserted comes out clean. Let cool completely. Meanwhile, make the cranberry butter by combining all ingredients except vanilla in a saucepan over medium heat. Cook until cranberries start to burst, about 5-10 minutes. Reduce heat and simmer another 10 minutes, until sauce thickens. Remove from heat and stir in vanilla. Let cool completely (better if cooled overnight). Make the frosting by combining all ingredients and beating on high speed until light and fluffy. When ready to serve, carefully flip the cake out of the pan. Slice it in half (from top to bottom). Add a layer of cranberry butter to one half, then place the other half on top. Frost with cream cheese frosting, and serve. Thanks to Audra for the cranberry butter recipe. The amount of frosting that this makes is only enough to cover what you see in the photo. You can double the recipe for enough frosting to cover the entire cake. SO FUN! I love that cranberry butter. Also, loving the new design! Oh so pretty!!! I love these flavor of cranberry and vanilla. Such a festive cake!! And I also love the last picture! So cute! GAH! You are so stinking cute :) And I love the new layout! Your site has always been beautiful, but I am in love with this look! Nature’s gatorade, bahahaha! I love it! I drink milk every day too and have been ridiculed profusely for doing such. It’s delicious, haters gonna hate. 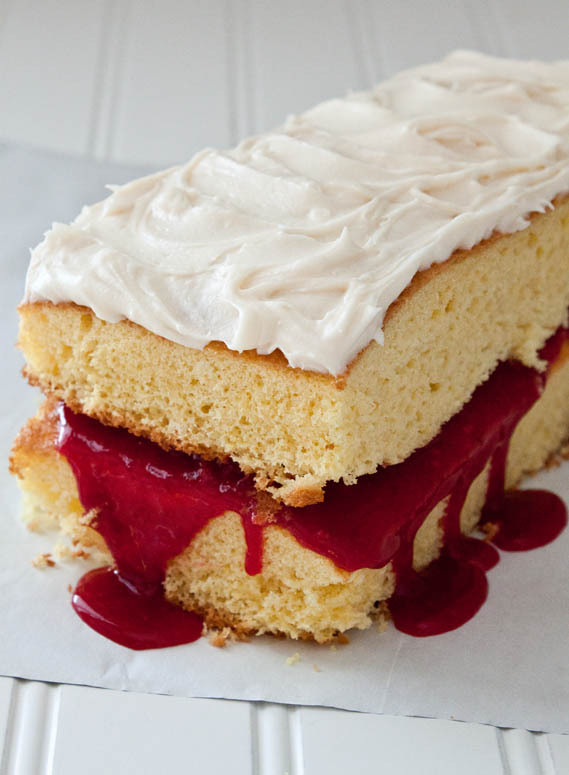 Your cake is looking mighty fine with that frosting and that cranberry butter! Love that you’re baking for a cause, my dear! You have such a genuine and warm heart and I want to squeeze you! Do you even know what your feeding in that picture? I’m sorry but the dairy industry is one of the cruelest forms of abuse a mother cow and her baby endure. That bull your feeding is in a veal pen and will be slaughtered in a few months all so that you can drink that babies milk. Please educate yourself. I am educated. I have a Master’s degree in agriculture from University of California, Davis. What is your degree? What I’m feeding in the photo is in fact, a heifer, not a bull. I understand how you feel. My heart felt a tug when the babies were separated from the moms. However, it’s the best thing for the health of the cow and heifer. The cow goes back to the herd and returns to her normal diet and heals faster. The heifer, once healthy and strong, joins the herd. Cows love to be milked. 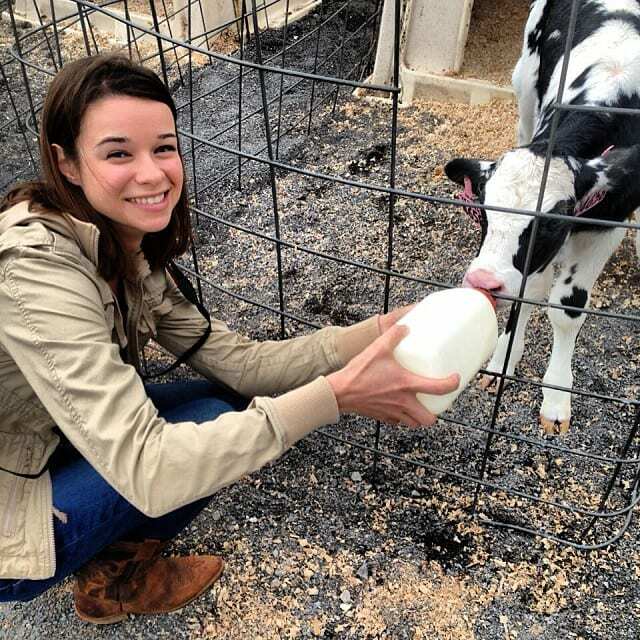 Have you ever been on a dairy farm? I agree with you Christina. I am 61 years old and I have drunk milk almost every day of my life. You are officially the cutest person ever. Also, I want to take a nap in the layers of that cake and eat my way out. If I came off rude. I apologize. My intention was not to offend you but just to bring awareness to a situation that I don’t support. I too have a Masters in Nursing and Education but not Agriculture and I don’t feel any less educated on the subject. I completely agree that eat what you want and be happy. When I said please educate yourself I should’ve said is there are two sides to every story….the cows and ours. No worries, Jesse. It’s fantastic that so many people are taking an interest in how their food is produced these days. Let’s not ever go back to the days of Orwell’s The Jungle. But I really wish people would not villainize farmers. It’s the hardest, most dangerous job out there. Farmers would never be cruel for profit, or use farming practices that aren’t sustainable. If they’re not acting responsibly, their business ends. It’s kinda like paper companies getting a bad reputation for cutting down trees…If they don’t ever replant, they would never have a business in the future! Have a wonderful holiday! Keep up the great recipes! Tasty and easy to veganize! You had me at cranberry butter. Love the sugared cranberries on top, so cute. And how cute is that little cow? This cake looks so yummy! I am a huge fan of cranberries and always looking for ways to use them. And I love that cute picture of you and the cow! Everything about this post is adorable! But i am not gonna lie i really love the last picture. What a beautiful cake! Love the cranberry butter filling! LOVE this cake – such great color! I love cranberries this time of year…just makes me feel totally festive! Yep, I will most certainly be dreaming about this cake tonight. 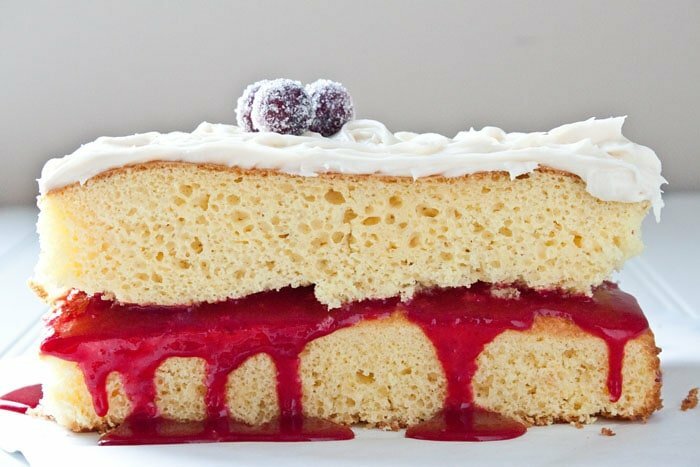 Vanilla cake with a fruity filling is totally my favorite! Gorgeous! And cranberry butter? I’m sold. This looks DELICIOUS. Cakes with something tart and some whipped cream, are my absolute favourite in the world. LOVE cranberries. This cake is sheer GENIUS!! I was thiiiiis close to making that cranberry butter just now! This certainly looks like a dream! 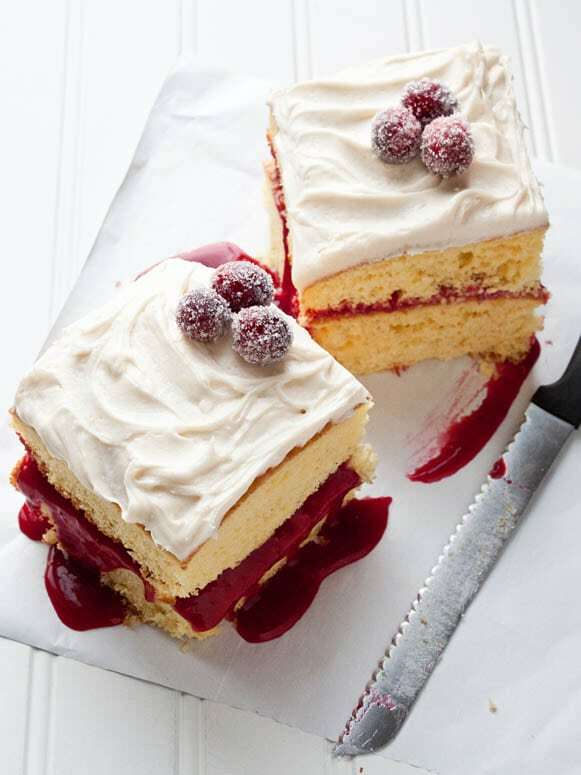 That cranberry butter sounds amazing — even better with vanilla cake and cream cheese frosting. PS That cow is too cute!! Those sugared cranberries on top make this just so pretty, I could put it out as a decoration. And then eat it two seconds later. Because it is also delicious looking. What a fun idea for a delicious dessert! Cranberry butter – it’s calling me! I would want to take that cow home with me too! Now this cake is just stunning! It’s almost too pretty to eat! These cake mix chronicles are making me smile! What a fun solution for small-batch baking! And that cow picture at the bottom, Christina….well that is just crazy cute! Looks like a little slice of Heaven! Yum! YOU, my gorgeous friend, are incredible. And incredibly BEAUTIFUL! I, too, love cows. But the picture of you and a cow… my heart nearly esplod’d. Also, have I mentioned how much I LURVE you? Cranberry butter and a two-person cake? Dude. Goodness.. this is positively gorgeous! It definitely looks like a restaurant-quality dish, and I’m sure it tastes just as good! Is it just me or are sugared cranberries the most magical freaking thing ever?! Like little fairies dusted them with frost I SWEAR, it kills me how awesome they are. All in all, the tang of the cream cheese and cranberry filling was perfect against the sweetness of the cake. Thank you SO much for sharing your recipe!